There are a lot of people who are very vocal about their hatred for Reddit’s new looks. I tend to agree with them as a lot of decisions that seem to have been made with a “form over function” mentality. Additionally, Reddit’s official mobile app leaves much to be desired; the mobile web is a cluttered mess. Although there are several strong contenders to fill the void, Reddit is Fun has been a fan-favorite for years. It is easy to see why. 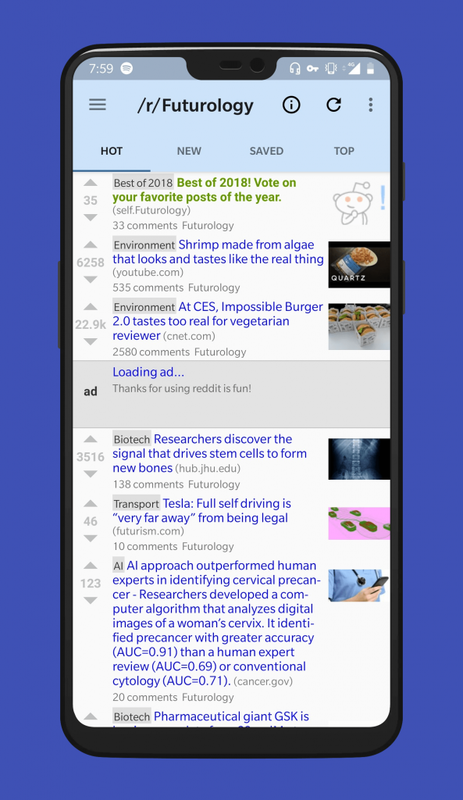 Reddit is Fun is an unofficial Reddit client, aimed at making Reddit browsing a fast, intuitive experience, devoid of eye-candy and flashy looks. It reminds me a lot of how the old version of Reddit looked like. Also known as RIF by its community, the app packs expected features such as browsing posts, an image viewer, in-app browser, and posts upload, along with a lot of nice-to-have improvements that enhance the Reddit experience significantly. You can actually use Reddit is Fun without having to log into your account. Actually, you can browse any subreddit without having an account at all. I dare you to try doing the same with any client from other social networks. Massive kudos to not only Reddit is Fun, but Reddit itself for allowing it. However, in case you want to import the subreddits you are subscribed to, make and upvote comments, or upload your own posts, you need a Reddit account and to link it to the app. This is done through an in-app browser that takes you to Reddit’s website, rather than by inputting your password directly on the app. After that, everything will be imported. A hamburger menu to the right will show all of your subreddits, while an overflow menu at the top will give access to your profile and post submission. All subreddit pages have a bar at the top with options to browse them according to best, top, new, controversial, etc. Each post is shown with the karma points to the left, and a thumbnail to the right, in case there is one. The middle is occupied by the post’s title (with a flair if it has one), the comments, and the subreddit. There’s no user in sight whatsoever. 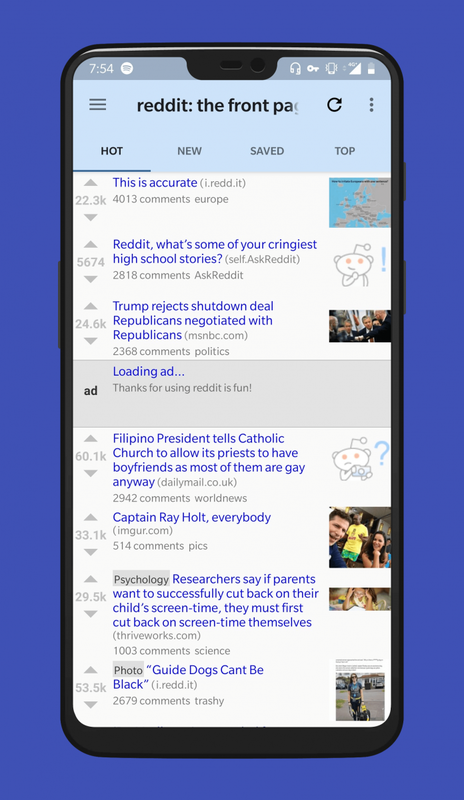 The overall feel of the app is very similar to what you would find in old.reddit.com. A white background with blue letters, some arrows for upvoting or downloading, and a thumbnail. If there is an app that resembles what you would have experienced on the desktop, it is this one. But, since Reddit has moved on to a new style, then some people might find this look a little antiquated. Sure, people who loathe Reddit for moving to this new design will feel right at home. 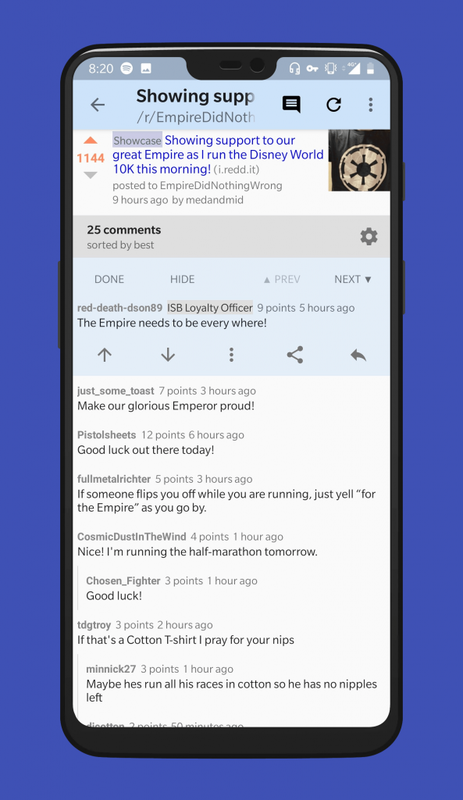 However, for those who prefer the new design, or are just looking for an interface that feels more at home in Android, then Reddit is Fun’s UI might not be good enough. Upon clicking on a post, a bar will appear at the bottom if it, with buttons for sharing, saving the post, hiding it, and showing comments. There are also some additional options under an overflow button to show the OP’s profile, opening a link in the browser, blocking a subreddit, among others. By pressing comments, you will be taken to the post details, where you will see the same information shown in the feed, plus the user and the timestamp of the post. The comments will be displayed below in a manner very similar to how old Reddit displayed them. The user, the flair (with pictures! ), the karma, and the timestamp. Tapping on a comment will also open additional options above and below it, with one of the most useful options I have seen on a Reddit app: navigate to the root or a parent of a comment. It is massively useful when reading long threads, and reduces the amount of scroll you have to make to navigate through it. When clicking on a root comment, you can also select between Previous and Next (root) comments, another massively useful tool. You can also hide a comment and all of its chain with the hide button, which works exactly the same as clicking on a vertical line on desktop Reddit’s comments section. There’s a native viewer for videos, images and GIFs, but they are pretty barebones. They even show a huge white space at the bottom or to the sides (depending on the aspect ratio). Also, apps like Sync for Reddit let you interact with the comments through long presses, but that is something that Reddit is Fun does not have. If you want to see your profile (or another user’s profile), then Reddit is Fun has a nice profile viewer. All of your posts and comments will be there, along with your karma and badges. You can also send users a message if you want. You can also filter only by comments, submitted posts, or people that have gilded the user. 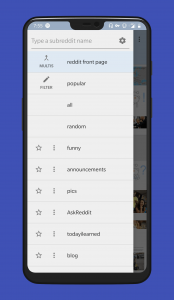 As is the normally the case among Reddit clients, Reddit is Fun has a lot of options available. There are several categories: from browser to data usage, from appearance to notifications. Almost every aspect of the app is configurable. You can change behavior such as preferring external browser, showing thumbnails on WiFi only, filtering NSFW content, saving browsing history, text size, theme (black theme is included), new post notification, among others. If there is a behavior you want to change, chances are that Reddit is Fun has an option for it. There is an option to turn off ads, which normally appear in the middle of posts when browsing a subreddit. However, turning off ads disables some options. It is a good trade-off: use the app for free without ads and enjoy most functionality, or keep ads on and enjoy more powerful features. Reddit is useful not only to network with other people, but also because there are so many niche communities that share the same passions or likes. Reddit is Fun has always been a popular option among users. 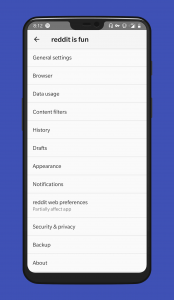 With its plethora of options, looks that closely resemble the old web design, and ads that you can turn off, Reddit is Fun is one of the most complete clients in the Play Store. There are some nuances, but overall it is a well-rounded app that is much more useful than its official counterpart. Download and install Reddit is Fun from the Google Play Store.